*Use with caution due to small numbers. Prince Edward Island and Nova Scotia – numbers too small to report. Source: CICH graphic created using data adapted from Statistics Canada, Environment Accounts and Statistics Division, Households and the Environment Survey, 2009. http://www.statcan.gc.ca/pub/11-526-x/2011001/t012-eng.htm – accessed March 12th, 2017. 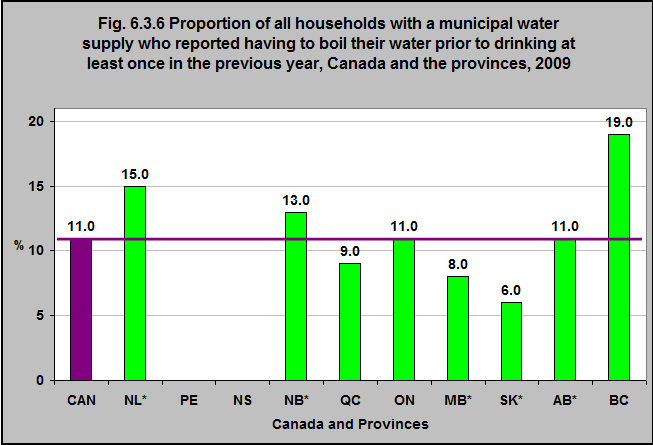 According to the Households and the Environment Survey, in 2009, 11% of all Canadian households reported that they had to boil their water prior to drinking at least once in the previous year. That proportion varied from 19% in British Columbia to 6% in Saskatchewan.